Mannington Ultra Clean is a cleaning solution created specifically for Mannington brand wood floors. However, it has proven successful on wood floors by other manufacturers as well. It is formulated to not damage the finish on wood floors. Mannington markets the cleaner as being safe for children and pets and stresses the fact that it does not leave any film or residue which can dull the look of the floor. 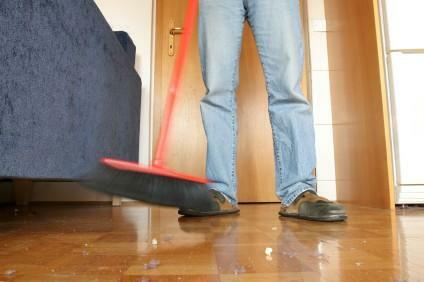 Use a broom or dust mop to remove dirt and debris that is sitting on the floor's surface. Spray a microfiber cloth with Ultra Clean, getting it saturated but not dripping. Get a new cloth and repeat step three each time the cloth gets too dirty. Let the floor air dry. Do not rinse. The company also advocates using Ultra Clean after wiping up spills with a paper towel or rag. It can remove the residue both from the stain and from the water used to clean it. Since Mannington floors are pretreated there is no reason to apply wax or sealant to them after cleaning. Ultra Clean comes in a 32 ounce trigger spray bottle, which is suitable for dozens of uses. There are both clear bottles and white bottles on the market, both of a different shape, so it is best to recognize the product by the label. The cleaner can also be purchased as part of the Ultra Clean Mop Kit. This set includes a 24 ounce spray bottle of Ultra Clean and a microfiber mop that is perfect for using on wood floors. The mop handle comes in three pieces so that it is travels well and fits easily inside the box. These products are available at most Mannington floor resellers as well as online at places such as amazon.com and 1877floorguy.com. While Mannington recommends using only Ultra Clean on its hardwood floors, citing its five-layer bonding process, there are other floor cleaners available that will give the homeowner similar results. However, since the company recommends only its floor cleaner on its floors, it's important to read any warranty on the floor carefully before going a different route. Doing so may void the coverage. These cleaners can be applied with a microfiber cloth, just as the Ultra Clean is. It's important to never clean a wood floor with an abrasive brush or sponge. The floor is very susceptible to scratches and can also chip or splinter if it is not handled delicately. Also, to that end, it's a good idea to cover high-traffic areas with throw rugs and ban both people with shoes on and pets with untrimmed nails from trekking through the room at any point. 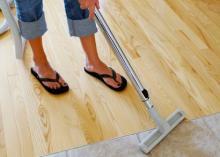 The most important aspect of cleaning a wood floor is not the cleaning solution used. Rather, it is that the person doing the cleaning does not let water sit on the floor for more than five minutes. If the wood becomes saturated it can warp, which will ruin the look of the floor. This makes cleaners like Ultra Clean popular not because they are the only ones that work but because they are the easiest and least risky solutions to use.